GET A FREE MP3 OR WAV DOWNLOAD OF THIS RELEASE WHEN YOU BUY IT ON VINYL : Just add the vinyl to your basket and we'll do the rest. You'll receive an email with a link to your free download when your order is processed. 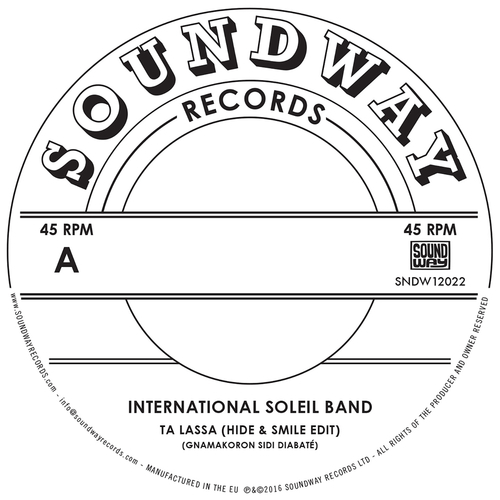 This 12" release is a slab of 1980s West African disco crossover from the International Soleil band from Guinee, West Africa. Composed by Gnamakoron Sidi Diabaté it was featured originally on an album released in 1983 by French Warners offshoot WAM (West African Music) - a short lived label that recorded about 20 releases of West African music released in France. Also Featuring Mory Djely Kouyate this track was a staple of the 22 band's repertoire in the 1970s (in which many of the ISB played) - famous for their recordings on the legendary state-run Editions Syliphone label. This 12" features an extended Hide & Smile edit on the A side and the original album version on the flip. An extended intro of throbbing bass and keyboard interplay punctuated by classic Guinee guitar lines, metronomic drumming and 80s synth sweeps eventually drops into a more recognisable Guinean vocal outing.